It’s difficult to come to a consensus on a CocoRosie album. Their music has a tendency to oscillate between unbearable pretension and spine-chilling beauty—a strange mixture of sounds, beats, and usually unintelligible vocals that leaves a decidedly heady but inconclusive aftertaste. On their fourth offering Grey Oceans (and their first with Seattle heavyweight Sub Pop Records), the oddball sisters Bianca (“Coco”) and Sierra (“Rosie”) Cassady have created a moody, ethereal sound that, as usual, makes sense only if one immerses oneself entirely into their perplexingly bizarre freak-folk world. The album art features a pair of medieval Gallic Rastafarian peasants striking a hipster pose at a convention for strange blue felt hats, and the fonts look like a third-grader’s ambitious first try at Photoshop. But don’t let the cover fool you. Beneath the seemingly all-consuming kitsch exists a record filled with moments of brilliance that surprise you with their intensity—and frequency. The macabre vocals leave one intrigued and frightened at the same time, like the image of a little girl in a flowery summer dress wielding a blood-stained pickaxe. Gauzy piano ballads are something of a running theme on Grey Oceans. The album starts off with ‘Trinity’s Crying’, a mélange of cascading piano notes and subtly intimidating synth melodies offset by sickly sweet vocals that sing abstractly about broken hearts. ‘Undertaker’ begins like a mesmerisingly strange Eastern European hymnal before Bianca Cassady effuses forth amidst swirly piano notes, with a darkly verbose song about snowy harlots and singing sinews (Joanna Newsom, anyone?). On ‘Gallows’, an achingly elegant harp strums along to creepy bird chirps and even creepier vocals; CocoRosie really capture the essence of poetic goth. ‘Lemonade’ is one of the best songs on the album. Clinking piano notes slowly congregate into chilling, death-tinged verses, before unexpectedly surging into a catchy chorus that is almost pop enough to be on the radio. However, the title track, despite featuring uncharacteristically clean vocals, is a little too underwhelming to capture and sustain interest, as is the case with the album closer ‘Here I Come’. CocoRosie falls squarely into the esoteric genre known as freak-folk, a collective of new-age hippies such as Devendra Banhart, Joanna Newsom, and Animal Collective. But what really sets the sisters apart is their surprisingly solid understanding of hip-hop beats. ‘R.I.P. Burn Face’, a bizarre song about a woman who seems to have died at sea with an acid-burnt face, shifts from gossamer-like spoken-word Farsi into a whimsically childish croon—and then the beat drops. ‘The Moon Asked the Crow’ is perhaps the most enjoyable song on the album, and sounds like what could be the soundtrack to Aladdin—or Courage the Cowardly Dog—as hallucinated by hip-hop royalty. Who knew that a lilting piano, heavy beats, and one of the eeriest voices in all of music can work so well together? Must-watch: Official video for ‘Lemonade’. And it is exactly this imaginative unpredictability that keeps you hooked, despite the overwhelming strangeness of their music. There is an almost schizophrenic shifting between styles, between genres, between entire time periods in music (medieval folk to futuristic electronica is harder than they make it seem), which makes them difficult to ignore, or mock. On the fascinating ‘Smokey Taboo’, an asymmetric tabla provides an unlikely base to both Bianca’s eerie croon and to Sierra’s drifting operatic elegance. It really takes genius (or crazy) to mix such disparate elements together, and expect it to work—and it does work, for the most part. Lily Allen meets Bjork on ‘Hopscotch’, a deceptively upbeat ragtime song, whose one verse speaks enigmatically of a dark, toxic relationship. ‘Fairy Paradise’ sounds like a dance remix of one of their own songs; however, it never gains enough stability to be anything more than a mildly irritating song. The line between annoying and enchanting is one that remains curiously blurred throughout the album, and, indeed, their entire discography. 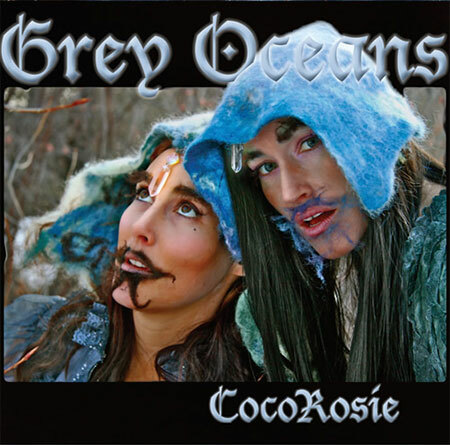 CocoRosie is definitely not for everyone; they have an almost eccentric irreverence to the rules of musical aesthetics. Sometimes it works, and produces some truly unique spots of beauty—but, just as easily, sometimes it just doesn’t work. Whether or not you’re willing to look for those often elusive moments of splendour depends on your musical taste: but you’ll often find that it’s worth it. Grey Oceans is definitely worth a few listens. You might conclude it to be an utter waste of your time or, just as likely, something of a masterpiece. By Sairam Natarajan · Ashim Ahluwalia's disturbing film is about a different kind of imperialism: a psychological one. By Chinmayi Bali · It’s an absolute delight to read Tabish Khair’s lyrical prose; to become embroiled in this labyrinthine “ghost of a true story”.